To those who have already conquered casual mountain biking trips, night cycling or any other number of biking variants, winter biking is the next logical step. Nothing challenges the body more than being taken out of its comfort zone and nothing is quite as uniquely exhilarating as meeting the open air as cold wind stings your cheeks and snow crunches beneath extra-wide bike tires. Winter is a great time for adventure enthusiasts to try new sports, but there are dangers to consider and unique challenges posed by the weather. For first time fat bikers, safety is the primary concern as you cycle on uneven, snowy terrain while alleviating the chills and spills that come with biking on a winter wonderland. Circulation will always be an issue when cold weather rolls around, and nothing can cut off circulation to the fingers and toes quite like the rigors of a cold-weather ride. While you can skip the need for specialized boots through waterproof socks and neoprene shoe covers, it’s not as easy to avoid the need for winter mountain biking gloves to offer warmth and protection to your hands. As always, ensure the gloves you choose are light enough to maintain flexibility yet warm enough to keep your fingers appropriately nimble. Snow may make for a soft-landing surface, but landing palms-first on a hidden rock will end any bike outing, so ensure your gloves can handle a tumble as well. You may start off cold, but any bike trip worth its salt will likely end with a rider feeling exhausted in a pleasant way and warmer than they want to be. In winter, this leads to the unique problem of sweating until you’re too cold to go on, necessitating an outfit that is appropriately layered. Changing between a thick winter jacket and a lighter waterproof shell can keep you drier for longer, and moisture-wicking clothing will keep sweat from cooling you off to the point of extreme discomfort. Along with choosing the right fat bike, pack all the gear you need to stay warm and dry in sub-zero temperatures. Know where your trail will take you through scouting or internet research and prepare for the weather accordingly. Depending on the altitude of your biking location, make sure to learn about common symptoms related to altitude sickness and how to beat it. 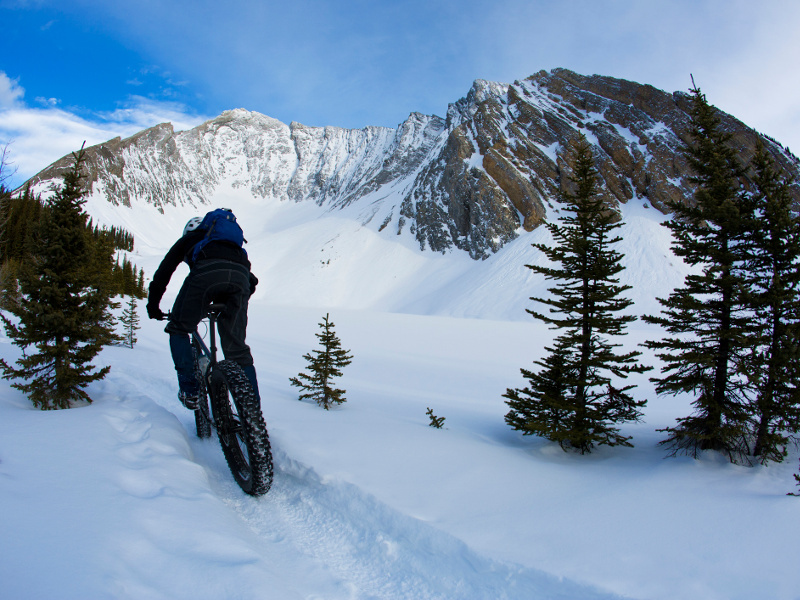 Before embarking on a snowy MTB adventure, make sure you choose the right bike. If you’re new to riding in wintertime, you might want to consider purchasing a fat bike, as it rolls easily through sand or snow, as opposed to common mountain bikes, which can’t provide you with proper stability. Moreover, a fat bike has very wide tires, making it perfect for riding on any kind of terrain, be it a trekking trail, muddy river or slippery road. Furthermore, extra precautions must be taken to maintain grip and riding stability on the muddy, icy or snow-caked surfaces you’re likely to encounter during the colder, rainier months. Test your brakes thoroughly to ensure they don’t seize up when the temperature drops, keep your tires properly inflated and always ensure your winter bike tires haven’t worn down to the point of uselessness. No grip on the ground means you might meet the ground face-first and that’s never a good time. Your winter bike may need to be equipped with extra carrying capacity for optional clothing layers or even emergency heating and temperature maintenance options in case of emergency. Temptation may lead you to consider turning off your phone and going without it, but this is a dangerous proposition if the winter months are in full swing. Ensure you have a friend or family member who knows of your plans ahead of time with instructions to check in on you occasionally. In case of medical emergencies, keep the contact details of local authorities or your travel insurance provider handy. Winter biking is a great solo activity, but remember to stay safe and accessible on the trails. Better yet, take a winter cycling trip with friends or family instead of a solo biking adventure. You might spur each other through the harder moments of your ride and form a bond through the hardships of grueling winter riding conditions. 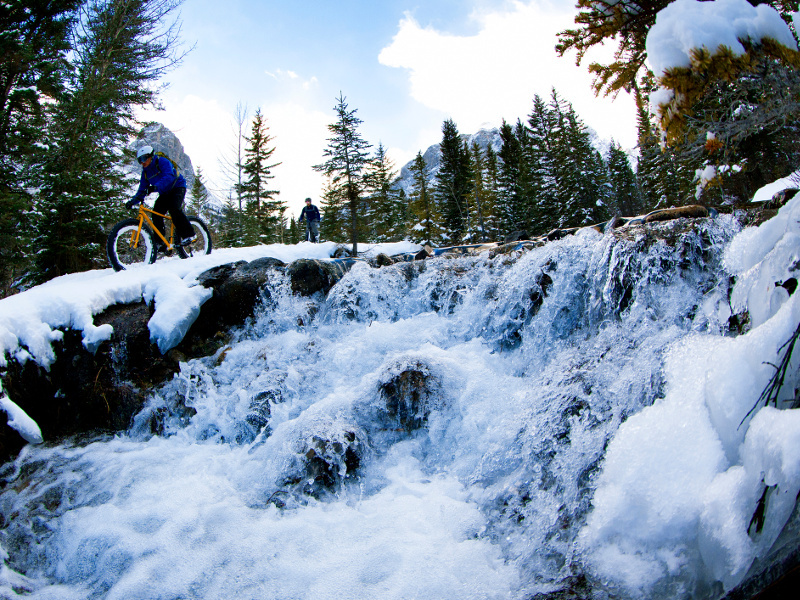 There are so many amazing winter resort destinations in Canada – some of them such as Whistler, Banff and Gatineau offer unforgettable mountain biking experiences in winter. Again, snow may seem like a soft surface to land on, but the ground beneath it is often frozen and unyielding. Skipping pads because you feel safe enough in a coat won’t help if you crash down on something harder than a snowball, so ensure your protective gear stays on. Check your padsfor cracks and imperfections before any ride. If you feel your gear makes you too uncomfortable or prone to sweating, seek out alternative winter cycling gear that controls moisture without compromising your safety. Before you head out to remote locations, know how to navigate snowy, icy and bumpy terrain. The core concepts of mountain biking may go unchanged during colder weather, but there are special biking techniques to consider when conditions may be more slippery than you are accustomed to. Sharp turns can lead to spills, overcoming root clusters may be an ice-coated trial and fording a puddle might be just as safe as riding your bike across a shallow lake. As long as you keep your wits about you and respect the preparation that is required for any non-ideal riding situation, going for a mountain biking trip in the winter can be just as enjoyable as the rest of the year. Once you’ve packed properly, suited up for tumbles and checked your bike to guarantee its preparedness for the rough terrain you intend to take it over, nothing can stop your desire to ride. 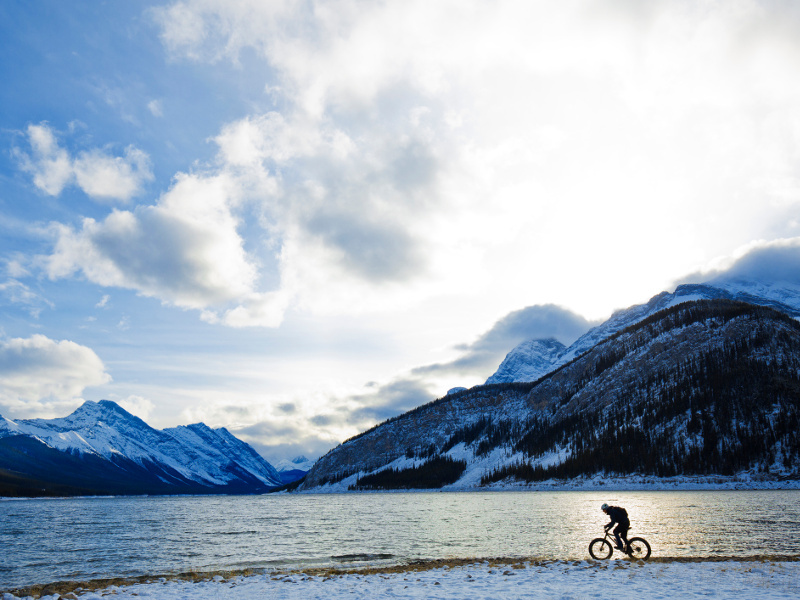 Don’t forget to confirm if your travel insurance will cover you for your winter mountain biking adventures, especially if you’re planning a ride in remote snowy terrain away from your home province. Not all travel insurance policies will cover you, especially if you plan to step out-of-bounds. Before you map your trail, check the fine print of your policy and learn more about how your travel insurance provider defines backcountry and out-of-bounds.